On this, the 67th anniversary of the Allied forces storming the beaches of Normandy, we wish to remember all of the brave soldiers who lost their lives fighting to ensure the freedoms of others. June 6, 1944 is a day that will not soon be forgotten. 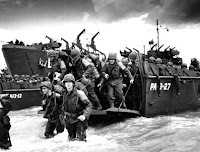 The military engagement that occurred on this day has long been considered the turning point of World War II in the European theater. Soon after the landing in Normandy, troops left France and continued on through Europe and into Germany. The United States military liberated millions while toppling the Nazi regime. Currently, there are more veterans of the historic D-Day invasion than any other engagement in WWII. Today, and every other day, we wish to remember the sacrifices and the commitment of the men and women who have served, and continue to serve in the United States Armed Forces.